When we get our hands on Mueller’s report—and ultimately, Mueller’s evidence—we’ll have a fuller picture of what he found. We know from Barr’s letter that in the report, Mueller “sets out evidence on both sides” of the obstruction question—and that Mueller says his report “does not exonerate” Trump. For now, all we have is the letter. And it doesn’t show that Trump is innocent of collusion or obstruction. It shows that collusion and obstruction were defined to exclude what he did. To be fair to Barr—and to Rod Rosenstein, who apparently was involved in the decision as well—there have been reports from the Department of Justice stating that Barr and Rosenstein have been aware of Mueller’s findings for the past three weeks, and that because of this advanced knowledge, it was possible for them to reach legal conclusions a mere 48 hours after Mueller delivered his report to Barr and the Department of Justice. But I will repeat what I have written before: Mueller is at least as good a lawyer—and a significantly better investigator—than both Barr and Rosenstein, and yet, according to Barr’s letter, he chose not to make any conclusions regarding the possibility that the president of the United States committed obstruction of justice. Are Barr and Rosenstein so incredibly much better than Mueller that they can do in 48 hours—or, let us be generous; three weeks—that which Mueller could not do, or chose not to do for the twenty-two months during which his investigation was running? 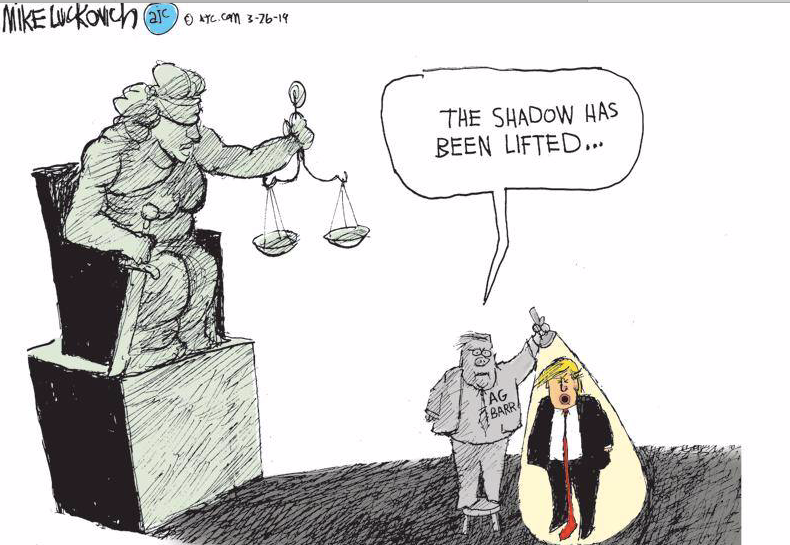 Indeed, we are confronted with a fundamental question when considering this entire issue: Why is Bob Barr involved with the decision to prosecute at all?
. . . Barr provided a clue to his reasoning, by suggesting that he did not see evidence Trump hampered the Russia probe with “corrupt intent.” As former Acting Solicitor General Neal Katyal has noted, it is hard to understand how Barr, or Mueller, or anyone, could gauge Trump’s intent, because the president has not been interviewed about his intentions. Why not? We know at least one person vigorously opposed to compelling Trump to submit to an interview: Bill Barr, whose 2018 memo declared that Mueller could not legally do so.
. . . As Ken White wrote in the Atlantic, “we don’t know whether Barr concluded that the president didn’t obstruct justice or whether he couldn’t obstruct justice.” But Barr’s lightning-fast judgment certainly points toward the latter possibility. We know that the report does not “exonerate” Trump of obstruction, and that Mueller himself felt it appropriate to leave certain “legal conclusions” to the attorney general. Mueller’s considerable deference to Barr could allow the attorney general to take a step the special counsel never did—interview the president. The fact that Barr chose to issue his judgment without doing so raises the strong possibility that he felt obstruction was simply not worth pursuing because it is constitutionally untenable, an argument that Barr has already endorsed. There is a second problem with the obstruction analysis in Barr’s summary: Rosenstein’s participation. Remember that Rosenstein wrote the memo that justified Trump’s termination of Comey, on grounds that Trump later revealed to be pretext. The New York Times has reported that Rosenstein believed the “White House used him to rationalize the firing” and deeply regretted his role in the incident. Former Deputy Director Andrew McCabe has written that Rosenstein wrote the memo under duress under orders from Trump. At a minimum, Rosenstein has a massive conflict of interest with regard to these obstruction allegations. And yet he consulted with Barr in deciding that Trump did not engage in “obstructive conduct.” It is bewildering that Barr invited Rosenstein to help him decide whether conduct that Rosenstein helped to justify legally might have been illegal. Not content with all of this, Barr is also giving the White House first crack at examining the report. As I have written before, I am willing to accept the fact that redactions need to be made regarding sensitive national security material, references to grand jury testimony and information concerning sources and methods. But no one in their right mind would trust this president and his team to fairly and accurately review the Mueller report, and ensure that the integrity of its message is not violated in any way. It appears abundantly clear that William Barr is less the attorney general of the United States. and more the chief legal hack of the Trump administration’s political team. Of course, the behavior of the attorney general of the United States is not the only reason to be outraged that the fix may very well be in. As this Twitter thread makes clear, the Trump administration and its odious allies are currently involved in lying and gaslighting on a scale that should appall and disgust even those who have gotten used to these sorts of reality-bending insults to human intelligence—the ones that have plagued our lives ever since June 16, 2015, when Donald Trump first announced that he was a candidate for the presidency of the United States. And to be sure, lying and gaslighting are only amplified by instances of remarkable hypocrisy. To be sure, Jed Shugerman is exaggerating. But not by much. This isn’t much of an exaggeration either, when it comes to discussing the state of affairs. Also, speaking of instances of remarkable hypocrisy, it is amazing that anyone in the Trump administration would think that they are well-positioned to sanctimoniously lecture media outlets about honesty. I am sure that all of this is just perfectly normal, that there is nothing to see here, and that we should go about minding other business. We can’t do better than this when it comes to selecting our leadership class?